Carte de la Syrie et de l'Egypte. 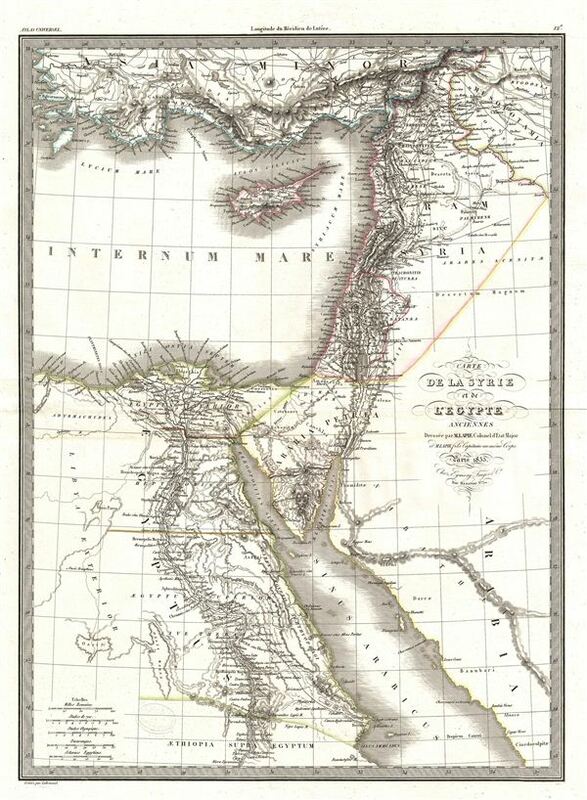 A fine first edition example of M. Lapie's 1833 map of Syria and Ancient egypt. The map covers all of Syria and egypt from Asia Minor to the Red Sea and Arabia. This map belongs to the time when egypt was ruled by Cleopatra VII, one of the most famous women in history. Following the suicide of Mark Anthony, Cleopatra took her own life and egypt became the Roman province Aegyptus. This map was engraved by Armand Joseph Lallemand as plate no. 12 in the first edition of M. Lapie's important Atlas Universel. This map, like all maps from the Atlas Universel features an embossed stamp from the Lapie firm. Rumsey 2174.012. Phillips (Atlases) 754, 765.